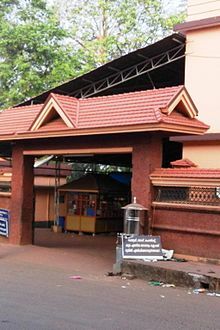 Kadampuzha Devi Temple is a Hindu temple and pilgrimage center at Kadampuzha in Malappuram district, Kerala, India. The main deity of this temple is Goddess Parvati/Durga in the form of a huntress. There is no idol of Goddess in this temple, and she is worshipped in a pit. The presence of Lord Ganesha is also believed to be with the Goddess, and there are sub-shrines for Lord Sastha and serpent deities. A separate Shiva temple exists near the temple, called 'Madambiyarkavu'. Both these temples are under the control of Malabar Devaswom Board. Wikimedia Commons has media related to Kadampuzha Devi Temple.